Don’t have much of a chance this morning to write a proper post. Busy in a good way. But I came across this image above from the late painter Romare Bearden who lived from 1911 until 1988. I was going to say African-American painter as it does in most of his biographies but that kind of bugged me in the same way that bios often point out that an artist is a woman. Seems like they are creating a distinction and putting them into a sub-category for no reason at all, especially when the person in question is creating great work. So I am just calling Mr. Bearden a painter. And a fine one at that, one whose work always jumps into my eyes. Just plain good stuff. Anyway this image has been sticking in my mind for about a week now and I thought it would be a great companion to some music for this Sunday Music by the one and only B.B. King. Especially since the central figure in the painting looks a little like B.B. King. I somehow have only played one song by him in all these years on this blog and it is definitely time to correct that oversight. I came across his Live at the Regal album as a teenager and it just destroyed me. It was a live performance from the Regal Theater in Chicago from 1964 and it is one of the great live recorded performances ever put down on vinyl, regardless of genre. It just reels and rocks and is filled with classic after classic tunes from B.B., Lucille–the only guitar whose name you probably know– and a band that kicks it big time. 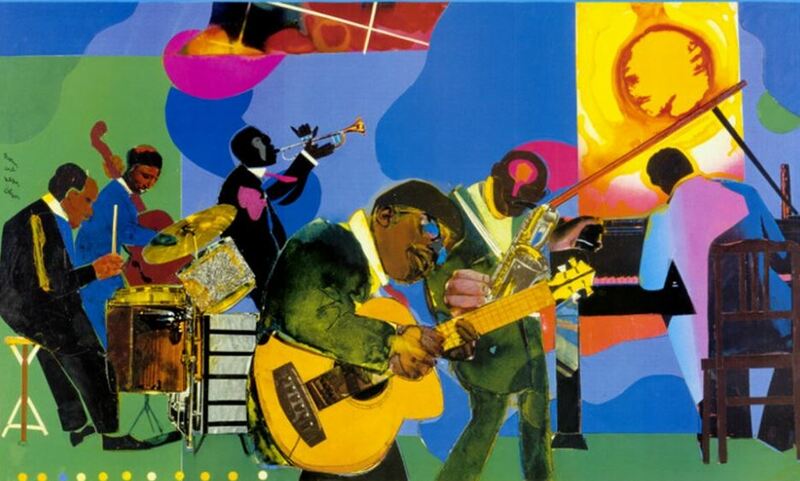 As with Romare Bearden’s painting, it’s just plain good stuff. Take a listen to the great Sweet Little Angel and have yourself a good–no, a great– Sunday.